Where do you see the Sensex over the next 12-months? The Retail Investor Behavior Index (RIBI) presents historical information on what investors have been doing in the markets during any particular period. Q. What is RIBI ? 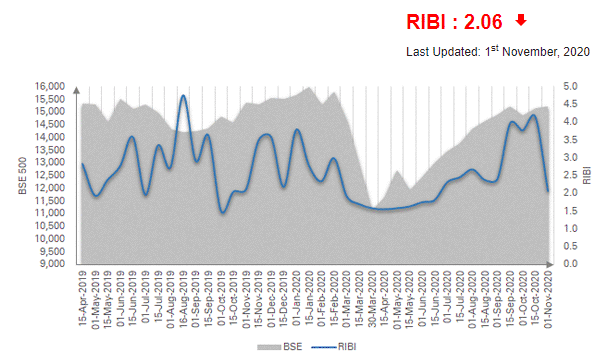 The RIBI or Retail Investor Behaviour Index is a proprietary, behavior-based index created and designed by ICICI Securities Limited to indicate the behaviour of retail investors based on their changing portfolios and trading activities. It measures what investors have been doing in the markets during any particular period. It creates a snapshot that can be observed over time, or compared to other market indicators, to suggest investor's behaviour based on the real portfolios held by retail investors. Q. How RIBI is calculated? Retail Investor Behaviour Index is calculated on a sample of customers who are participating in equity markets for the period under consideration. RIBI is calculated by using a proprietary formula applied on sample customer data without identifying the individuals from the sample customers. For aggregating purpose, index is combined by taking fortnight wise median of individual scores at customer level. Q.How to interpret the report? It's best to review RIBI trends over time, rather than focusing on one fortnight's score. If the score increases fortnight over fortnight, it implies that investors had shown a positive investment outlook and vice versa. Q. How can RIBI be used for investment decisions? While the RIBI can show the trending retail investor behavior, it cannot predict the direction of the market as it is based on historical information. Investors are not supposed to make their investment decisions taking RIBI as a base but use it only as a tool to indicate retail investor behaviour. Q. How often RIBI is updated? RIBI is updated at the end of every fortnight. Hence, the score would not factor in latest changes in investor behaviour which would have arisen after the index was last calculated.